Public beaches in Eastham include two spacious stretches on the Atlantic Ocean, along with a number of smaller beaches on Cape Cod Bay. On the Ocean-side beaches, the waves are big and surf-worthy, the water's cold, and the dunes are imposingly tall. It's breathtaking! On the town's Bay-side beaches, it's a whole different world. 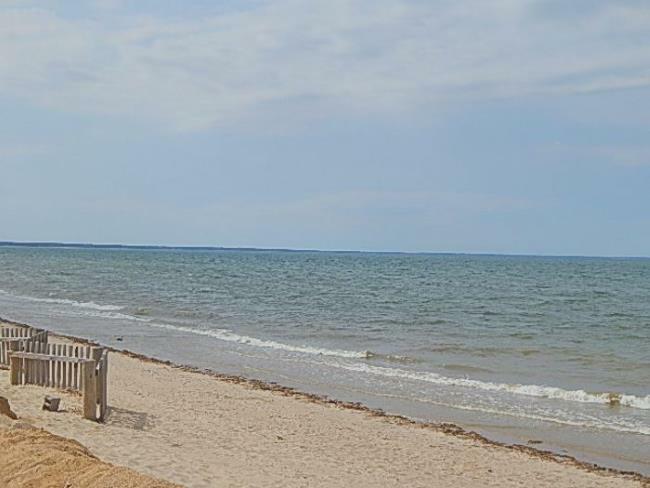 Eastham's Cape Cod Bay beaches are especially good for families with small children, thanks to the temperate waters, gentle surf, and miles of sand flats and tidal pools that provide great splashing and exploring at low tide. Lifeguards, shower/rinse-off, and bathroom facilities are available (in season only) at the National Seashore beaches in Eastham. See the beach descriptions below for details. Cape Cod National Seashore beaches are open to everyone, year round. During the season, there's a $20 per day beach parking fee, a $10 fee for motorcycles, and a $3 entrance fee for anyone who comes to the beach by bike or on foot. - Weekends and holidays from late May to late June. - Every day from late June through Labor Day. - In the off season, it's all free! Coast Guard Beach is routinely voted one of the "Top 10 Beaches" in the USA. In 2010 it was #7 on Dr. Beach's Top 10 list ... two places ahead of Hamoa Beach in Maui, Hawaii! As with all Atlantic Ocean beaches on the New England coastline, the water is chilly, even in mid-summer. Actually, it's downright cold ... upper 50s to low 60s. But that doesn't deter hearty swimmers, surfers and boogieboarders from plunging into the rolling waves and sparkling clear water. For those who prefer to stay warm and dry, Coast Guard Beach is also phenomenal for long walks. Head south (to your right as you face the water) toward Nauset Inlet, and keep your eyes open for seals in the surf just off the shoreline! Crowd Factor: Coast Guard Beach does get crowded. Most people tend to congregate near the first lifeguard station. If you walk a little way up or down the beach, it's usually easy to find some "alone space". Amenities (Seasonal): Lifeguards, restroom and shower facilities. Coast Guard Beach is also handicapped accessible and has oversand wheelchairs available in season. Directions: Rt. 6 to Doane Road. Parking: In season, vehicles must be parked at the nearby Coast Guard Beach/Little Creek Shuttle area (watch for signs on Rt. 6). From there, transport shuttles run regularly to and from the beach. If you arrive at the Shuttle Area by 10:30 a.m., you should have no problem finding a parking spot and little waiting time for time for the shuttle. Not to be confused with Nauset Beach in Orleans, this Cape Cod National Seashore beach is Nauset Light Beach - named for the lighthouse that stands guard about 300 feet inland from the bluff. Nauset Light Beach is about a mile north of Coast Guard Beach, and shares many of the same attributes - beautiful sand, good surf, cold water, and lots of room. This is one of the best beaches in Eastham for snapping some amazing photos. If you stand at the viewing area near the parking lot, you'll have a great vantage point for shots of the lighthouse and the ocean vista from atop the dune. ** SPECIAL NOTE - Nauset Lighthouse is open for free tours several days each week, from early May through late October. Click here for the lighthouse tour schedule. Crowd Factor: This is one of the most popular beaches in Eastham, but the smaller parking lot tends to keep the crowdedness down a bit. Amenities (Seasonal): Lifeguards, restroom and shower facilities. Directions: Nauset Road (off Rt. 6 in North Eastham) to Cable Road. Parking: Vehicle lot usually fills by 10 a.m. during the summer. A few of the town-managed beaches in Eastham have (seasonal) lifeguards, bathhouses, food, etc., but many do not. In each description below, you find a listing of the services and amenities available at that beach. 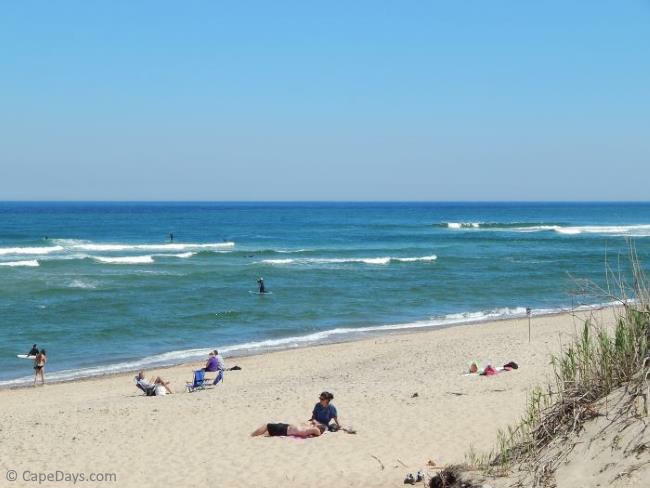 Like the National Seashore beaches, Eastham's town-owned beaches are also open to everyone, year round. Parking charges are imposed in season only (late June to Labor Day). In the off season, parking is free. Daily passes can be purchased at the beach gate. Weekly stickers are available at the DPW/Natural Resources at 555 Old Orchard Rd., Eastham, MA, or by mail-in application. Click here or call (508) 240-5976 for more info. Important: Town-issued stickers are not valid at Cape Cod National Seashore beaches, and National Seashore passes are not valid at town-managed beaches. It's called "First Encounter" because this is the site of the first encounter between the Pilgrims and the Native Americans on Cape Cod in early December of the year 1620. This is one of my favorite bayside beaches in Eastham, with its low, rolling sand dunes and wonderful view of Cape Cod Bay. Like much of the Cape Cod Bay shoreline, First Encounter Beach features warm, calm waters and expansive sandflats at low tide. Crowd Factor: Does get quite busy in July and August. Amenities (Seasonal): Lifeguards, restroom/bathhouse facilities. Oversand wheelchairs available in season. Call (508) 240-5000 to reserve. Directions: Turn off Rt. 6 onto Samoset Rd. (opposite Town Hall). Beach is at the end of Samoset. Parking: Decent number of spaces, but the lot does fill on busy days. Daily fee payable at the gate, or town-issued sticker required. Campground is a small beach that's popular with folks who own a home or rent a cottage in the neighborhood. There's not a whole lot of room to spread out at Campground, particularly when the tide is high. At low tide, there's considerably more sand. Crowd Factor: It does get crowded at Campground Beach during the summer. To have "first dibs" on a good spot, get there early. Amenities: None, except restroom facilities (porta potty). Beach wheelchair available in season. Directions: Turn off Rt. 6 onto Old County Road. Go to stop sign at Massasoit Road and turn right onto Massasoit. Then take first left onto Campground, and continue to Shurtleff. Go left on Shurtleff, and the beach will be just around the corner to your right. Parking: Not many spaces, so get there early. Daily fee or town-issued sticker required. This is one of those "off the beaten path" beaches in Eastham - literally. There's a trail at the end of the parking area that leads to this small, quiet stretch of sand on Cape Cod Bay. Dyer Prince is a nice place to spend a few peaceful hours with that special someone, or just hang out on your own watching the wildlife. Crowd Factor: Not usually an issue. Directions: From Rt. 6 rotary, take Rock Harbor Rd. to Bridge Rd. Cross over bridge. Dyer Prince Road will be the 2nd street on your right. The beach is at the end of Dyer Prince. Parking: Very limited. Town-issued sticker required. Sunken Meadow is another of the small Bay beaches in Eastham that's great for a couple hours of hanging out time. It's not the most scenic beach in town, but it does have a good amount of space and the warm, calm waters that Cape Cod Bay is known for. That's undoubtedly why Sunken Meadow appeals to so many families with small children. Amenities: None, except restroom facilities (porta potty) in season. Directions: Massasoit Road (off Rt. 6) to South Sunken Meadow Road. Beach is at the end of South Sunken Meadow. Cooks Brook is one of the smaller beaches in Eastham. But the lovely view of the Bay and the soft sand dunes make this beach well worth a visit. Crowd Factor: Rarely gets very crowded. Amenities (Seasonal): Lifeguard, restroom facilities (porta-potty). Beach wheelchair may be available. Call (508) 240-5000 to inquire. Location: Massasoit Rd. (off Rt. 6) to Steele Rd. The beach is at the end of Steele Rd. Parking: There's a good sized lot at Cooks Brook. Daily fee or town-issued sticker required.